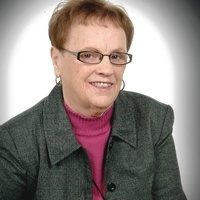 Obituary for Elizabeth (Betty) Cusson | D. J. Robb Funeral Home & Cremation Centre Ltd.
Peacefully passed away in her sleep at Chancellor Park Nursing Home on Tuesday, March 19, 2019 at the age of 83. Predeceased by beloved husband James Cusson. She will be missed by sister Lucy Meaney; nieces Anita Reynolds and Lori Porter; nephews Craig Meaney and Paul Meaney (Lisa); as well as all other nieces, nephews, family and friends. Special thanks to the staff of Chancellor Park especially 3 West for their continuous compassion and care. Cremation has taken place. Visitation at Caul’s Funeral Home, LeMarchant Road, St. John’s, NL on Thursday from 2 p.m. – 4 p.m. and 7 p.m. – 9 p.m. Mass of Christian Burial will be held at Sacred Heart Church, 1465 Lecaron Ave. Sarnia, ON on Tuesday, March 26, 2019 at 10:00 a.m. Inurnment to follow at Resurrection Cemetery. Arrangements entrusted to the D.J. Robb Funeral Home & Cremation Centre Ltd. Memories and messages of condolence may be sent through www.cauls.ca and or www.djrobb.on.ca.